It’s like a lot of different festivals interwoven weirdly together, perhaps all the other festivals you’ve been to soldered together by benign mutant elves. I could name loads but I see what you’re saying, two to be going on with. So I’ll offer Byron Vincent and Caroline Bird. 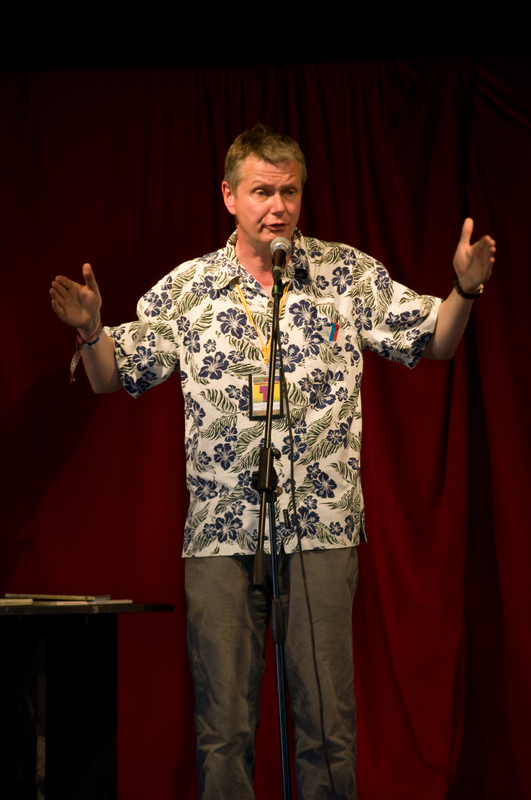 On the understanding that John Hegley goes without saying. All sorts of things, so many things. Solid things more than abstract things. Tea bags, kippers and slugs, more than truth, justice and beauty, though I try to do justice to the true beauty of these things. Having said that, recently I was commissioned to write lyrics on the themes of Friendship, Respect, Equality, Excellence, Courage, etc, and though I found it challenging I went for it & was ultimately pleased with the result – especially when set to music by Thomas Hewitt Jones. I like to think I’m driven by an old-fashioned mix of wonder and longing, the desire to touch the inner chambers of people’s most secret heart. That sort of thing. Tight contest between a toilet in Cirencester, and an empty Newton Abbot Market place – the latter the most strange because I was contractually obliged to perform to this empty space, and did. Builders on a nearby roof came to the edge to listen. I asked them for a chip, a chip was chucked and I caught it on my mouth. Their applause brought more people out. They listened politely. Later one of the builders bought a book and recommended Les Barker to me whose work I didn’t then know. Now I’m a fan and have been proud to have him on the Wondermentalist Cabaret. Just written an intro to new book ‘Mindless Body Spineless Mind’ a motley collection of flotsam and jetsam, stories and poems, out Dec 1st, but as soon as I’ve answered these questions I crack on with a new poem about harvesting the elements ‘siphoning sunshine’ for a turn at The Green Energy Awards the day after tomorrow. Here’s an onomatopoeic tennis poem Thwok , put up recently by wonderful Chris Redmond of Tongue Fu and Hip Yak Poetry Shak. Q1) What is your connection with Poetry &Words? 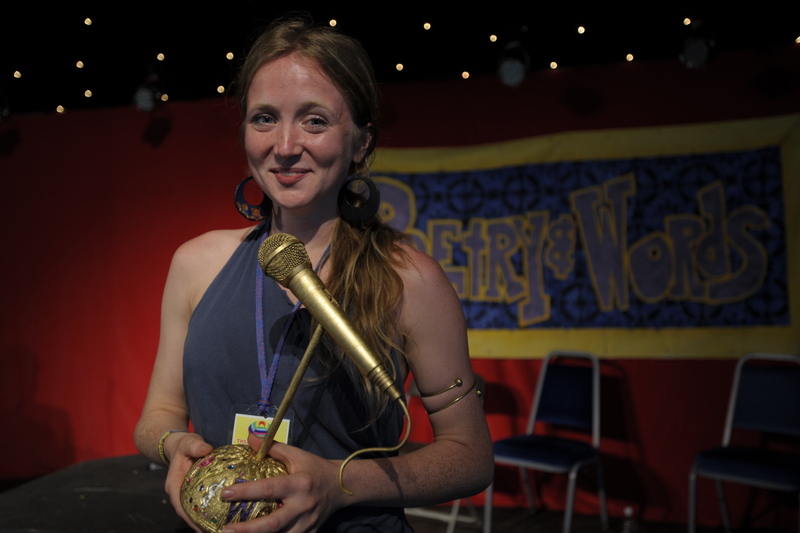 I was invited to perform in 2009.The curator of the stage, Helen Gregory, had seen me perform in Bristol on tour with Hammer & Tongue Oxford in 2006.The invitation took me by surprise. Before then I had no clue what Glastonbury Festival was, but Wikipedia explained everything and it blew my mind! I had seen Exit Festival on MTV and always thought I’d like to go. I remember thinking “they have a poetry stage at Gl astonbury that is super amazing!”. I returned the following year which was such an honour. Ed. 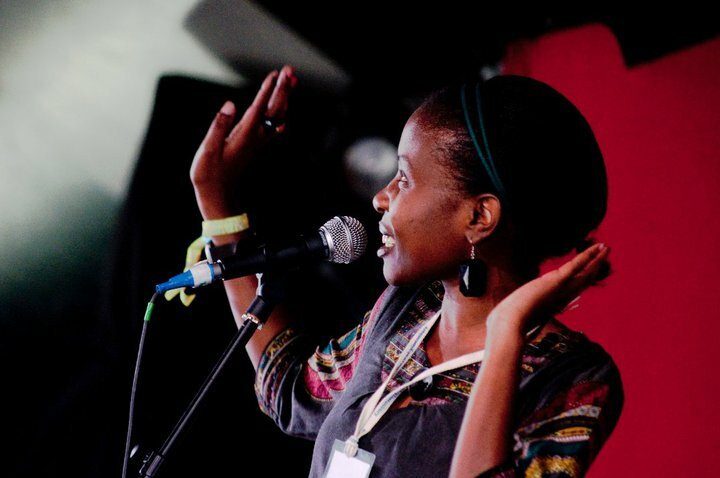 Andreattah also contributed to the BBC Radio Four poetry-play Glastonbury Poetry Diaries in 2010. Is it even possible to describe Glastonbury festival when pictures and videos fail? It is one of the most awesome places to spend 5 days. A farm literally turns into a city that sort of resembles Alice in Wonderland. It is so big that it is impossible to discover all its magical corners. You could find yourself in an enchanting tent listening to poetry, in front of the Pyramid stage watching Stevie Wonder, or some soul/funk at West Holts, be on a queue to watch a 3D movie or be lying down having massages and the best chai tea in the Healing fields. And that’s only 0.1% of things you can do. Derrick Brown – whom I shared P&W stage with back in 2009.There is sincerity in the choice of words he uses and his tone. That’s my kind of poetry. He can also bring ‘funny’ into his poems without it sounding cheesy. Another poet would be Suheir Hammad. I bought her book Zatardiva after watching her turn the air electric with her words in Johannesburg a couple of years ago. She is demure in her delivery, but her words come out like a stampede at you and shake you. Every time I read her work I find something new. I don’t have list topics I gravitate towards. Whatever moves me to release in the form of a poem, I usually oblige. I did an outside art collaboration in a garden, smack in the middle of a school in Botswana. It was a silhouette of me while I recited a poem from behind the screen. That was cool! I’m currently working on an EP called The LoveNotes EP with an amazing South African producer called Mark Sunners. It will be available on my bandcamp as a free download when it’s done. There is a talented Rwandese-Belgian artist called Soul T whom I recently met and we will be working on a track together – my first collaboration in Brussels. I’m also working on my French. I performed for Poetry&Words in the days when Pat V T West was running it and have been on the Poetry&Words committee since Helen took over and Poetry&Words moved to its current location in Theatre and Circus. I have had several roles, from host to general roustabout to artistic director to performer during my years of involvement. Ed: Pete has been a valuable member of the P&W crew for many years. You won’t catch him on site in 2013, but he’s still working hard for us behind the scenes. It’s the biggest party ever with so much to do it’s impossible to do everything. It’s busy, exciting, peaceful, sleepless, amazing, magical, eye-opening, deafening, thrilling, frightening and a weekend worth experiencing at least once in your life. Matt Harvey for his wordplayfullness and calm, quiet, delivery. Kate Tempest for her passionate delivery. Originally I was inspired by telling tales, with an emphasis on comedy – exploring what is absurd and ridiculous about life, how circumstances and the mind trick us and each other into being fools. I also saw writing a poem as solving the puzzle of getting from the first line to the last in the best and, as I was writing for performance, most entertaining way possible – be that through wordplay, the inclusion of jokes or the manner of performance. I enjoy exploring my own poetic forms too. More recently I have been writing poems that are descriptions of situations or memories, trying to create an image in the readers’/listeners’ mind that they can explore themselves. I am not so concerned with being entertaining, or funny, but in sharing. Mostly. I think the most interesting place I have performed was in a town in Germany called Regensburg, where I was taken to compete in a slam. The building contained a restaurant and venue with bar on the ground floor, a nightclub in the basement and dormitories on the first floor. So myself and a couple of other poets got the bus to Regensburg, walked 150m from the bus station to the venue, ate, slammed, danced and slept in the same building and the next morning walked 150m back to the bus station and left. All I saw of Regensburg was the inside of that building. 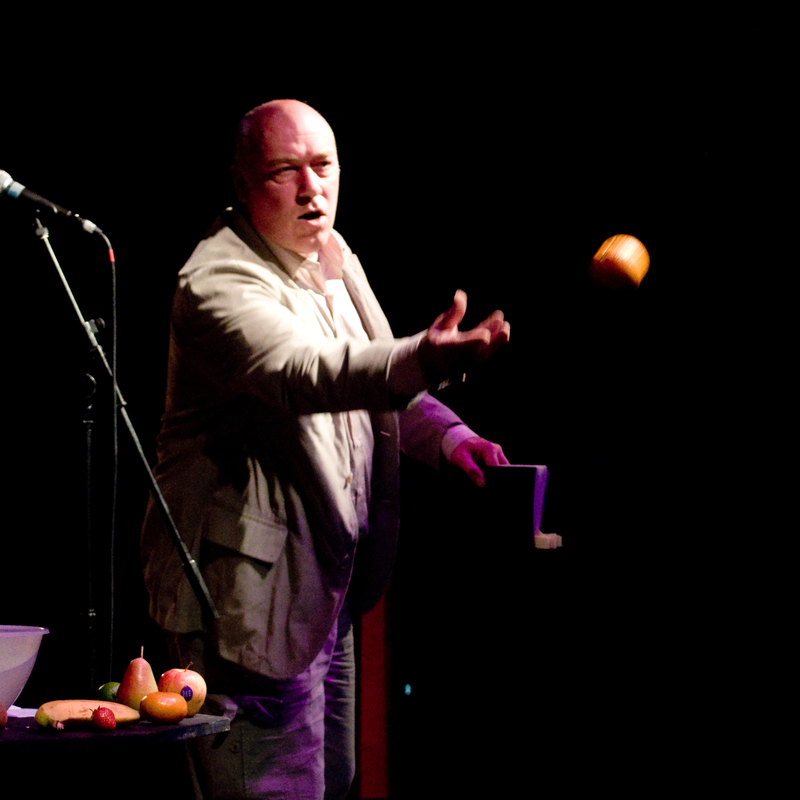 I have also performed in a nightclub; in a church service in Texas; in a pub beneath a huge TV showing an international football match; at an anti-GMO rally in Greenwich Park; in an auberge in France and in a living room. I am not gigging much these days, (let’s not go into it) but have agreed to do a gig for a friend in mid December so need to get a set together for that. It may well be a more political set than usual, due to the nature of the gig, but we’ll see. Other than that I am continuing to jot down ideas and make notes with the intention of maybe producing an illustrated collection of new poems. I think I read somewhere that there was a village in England called Borange, or Boringe that was a true rhyme with orange, but other than that I might stretch to syringe or hinge. Oh, and I do know someone who’s surname is Collinge, which rhymes.